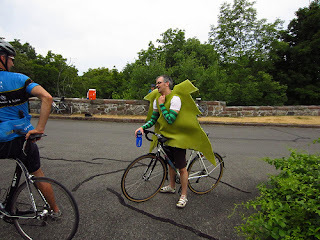 It's hard to describe to non-cyclists why I like riding my bike so much. Whether it's the quest to push oneself to another physical level, the undeniable exhilaration of speed, or just the simple freedom that a bicycle provides, most of us cyclists just really love riding our bikes. 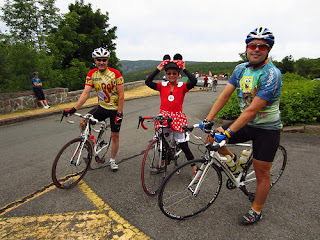 This year at the Hell Climb, I got to witness many fellow cyclists enjoy riding their bikes as much as I do. 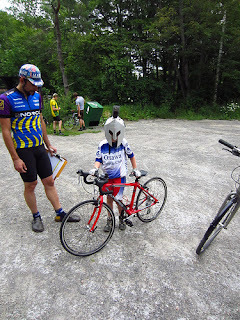 Once again, the Ottawa cycling community came out to have some fun and raise some money for charity while doing so. 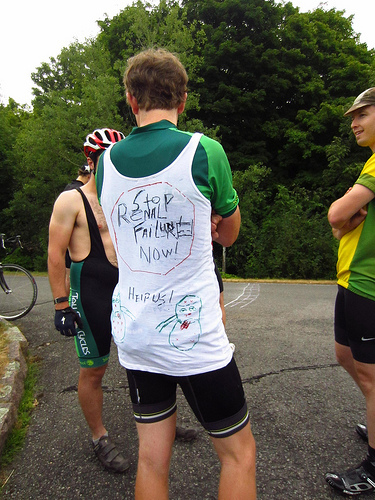 Starting from the base of the Fortune Parkway, entrants time trialled 6.2 km mostly uphill to the Champlain Lookout. 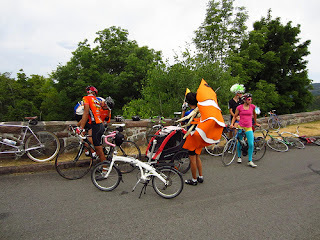 Once again, friends embraced the spirit of the event, coming in costume and bringing their most unique bicycle. 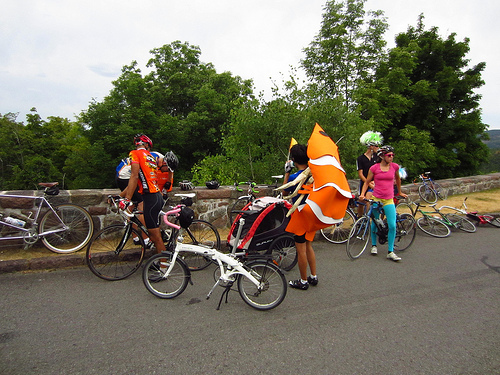 Anyone who happened to be in Gatineau Park on Wednesday evening would have done a double-take after seeing a giant shrimp, or a really Tall Tree, or a bunch of zombies out riding their bikes. There were cyclists on their race bikes, on fixed gear bikes, folding bicycles, tandems, pulling trail-a-bikes, pulling Chariot child carriers, and even pulling trail-a-bikes and Chariots! Every participant put in a strong effort, but also finished with a smile on their face. 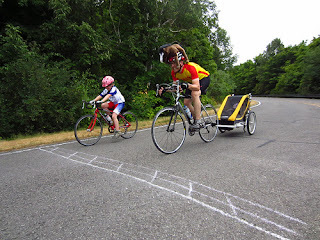 Highlights for me were the number of families that chose to ride together and seeing the determination (and subsequent joy) of the youngest competitors finishing what was undoubtably a very hard ride for them. We had three riders under 10 years old climb the steepest hill in Gatineau Park. The money collected this year went to The Ottawa Hospital's Kidney Research Centre, the first Canadian research facility dedicated to researching the causes and cures for kidney disease. A total of $900 was raised on Wednesday. Thank you for your generosity! A special thanks to all of this year's volunteers: Deb, Tanya, Jamie, Iain, Rodd, Neil, Andy, and Noah. Thanks to Grant and Tall Tree Cycles for the prizes. This year's Hell Climb was sponsored by NRG Canada, Specialized Canada, Outdoor Gear Canada, and Re:Form Body Clinic. Also a thank you to Matt who is the driving force behind the event. Pictures are posted here. We'll post more as we get them. Thanks once again to everyone. We look forward to seeing you again next year!